To me it looks pretty much like Heather challenged me HERE to give her sketch a try! Or at least I assumed she was talking about me! :) So you know I had to play! Anything that contains ribbon right? I'm so there! And here is what I came up with! I messed up on the first layer so it doesn't look exactly like the sketch but I just went with it! 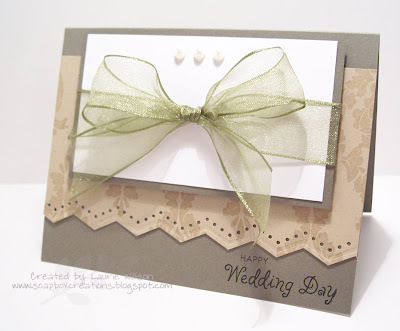 I had to center the card all around the big ole bow! I thought with the colors...which don't look very good in the picture...it would make a great wedding card! 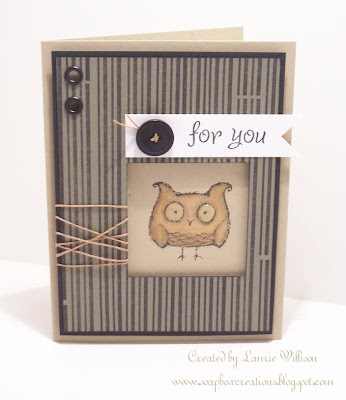 So I used one of the new sentiments from TAC's Level C set, Thinking of You! I am still here...I think! This has been the busiest summer EVER. With T-ball, swimming lessons, library day, open houses, church stuff, birthday parties...ok I will quit. But seriously, that is the beginning of the list! I had to jump on here real quick and share a card! This set is new in the TAC catty! It is called Happy Thoughts! So cute! 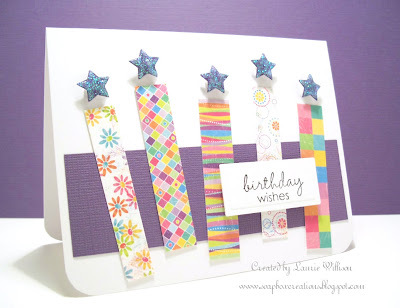 I host the Color Combo Motivational over at Paper Wings so today's card reflects my colors! I chose...Kraft, Black, Green and White! 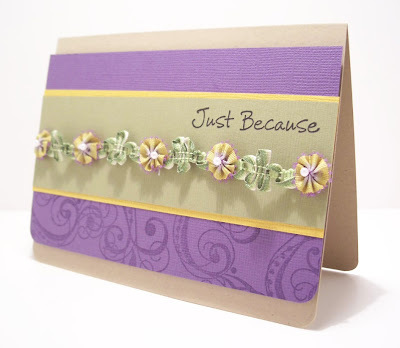 It was a super fast and simple card, taking inspiration from Barb's card HERE! 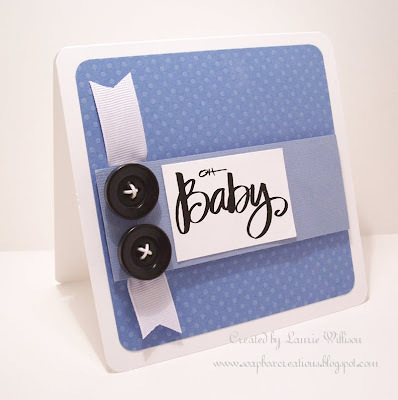 I love the idea to use the buttons on this stamp! Isn't it cute? Well, I am off to get ready for Library day tomorrow! I am leading our weekly craft! We are making Lunch Sack Albums! I will be back later in the week to share! Needing some inspiration? Well you came to the right place. Today my Angel friends and I are having an Angel Art blog hop! 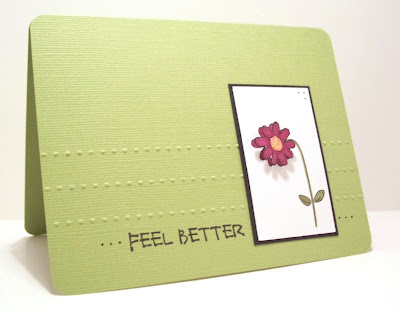 You will see cards here for all kinds of occasions. There is a list of their blogs at the end of the post! Here are three of my creations! This first card is my favorite! I found this adorable piece of trim at Hobby Lobby! It is sold by the yard so I had to try it out! I am really happy with it! I just added a glue dot on the back of each pleat. It doesn't add too much bulk, but you know I really like that anymore! 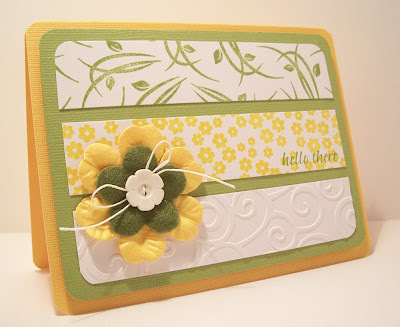 The background of this card is made using the Scor-Pal! It adds so much to a simple and fast card! I took an up close of this one so you could see the detail! I popped up his heart with glue dots and added the wire again....Thanks Barb! 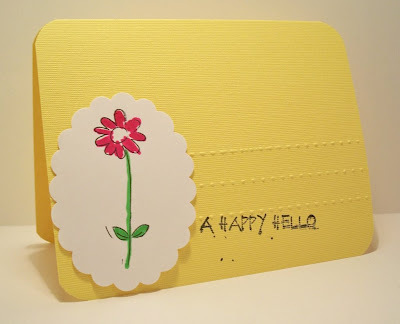 The card base is made just by scoring a grid with the Scor-Pal! That tool is a must have, I am telling you! It does everything.....except clean my house! If you have any questions, email me at llwillison@hotmail.com! Thanks for stopping by! Yesterday was my nieces Birthday and today we are getting ready to go to her party! She is getting to be such a big girl it is crazy how the time goes by so fast! 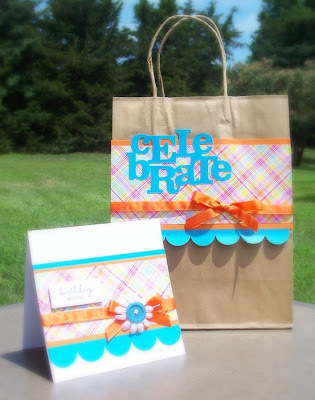 So, I thought I would make a more "grown up" card and bag for her with something other than pink! 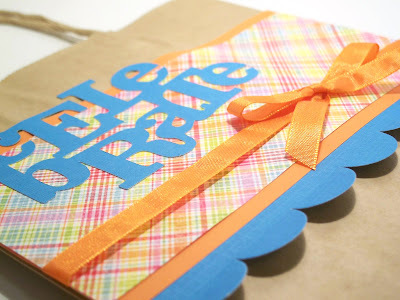 I LOVE making gift bags because they are so much more personal this way! And of course then it matches the card! 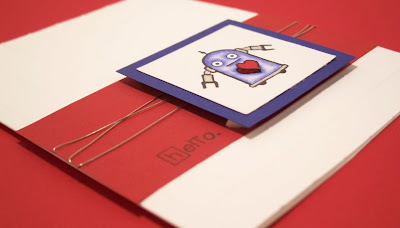 Here is a close up picture of the card! I used a DCWV card base that I got on clearance from Archivers! 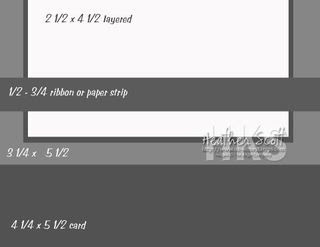 It really is soooo much cheaper to make your own cards! Here is a close up of the bag! I used my cricut to cut out Celebrate! I just love these colors! So bright and cheery! 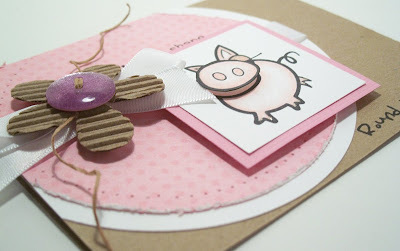 Here is just a fun, quick card I made yesterday! I used this sketch over at Paper Wings for my weekly Sketch Motivational. I saw a sketch very similar to this one somewhere and had to make something with the same idea! 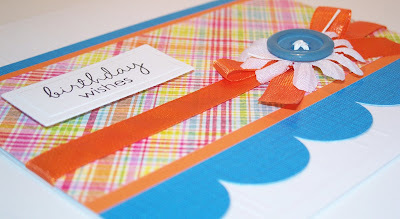 I love the texture of this card and the colors! 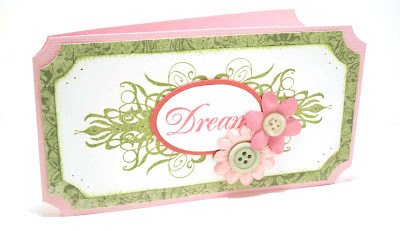 This stamp set is called Enjoy Nature and it is a Level A Hostess Set for The Angel Company! If you would like to host a FunShop, email me! 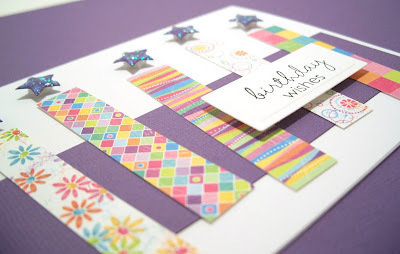 With sales of $100 for a qualifying party, along with some other fun benefits, this stamp set can be yours FREE! Email me at llwillison@hotmail.com! Here are three more cards I made for the catalog! 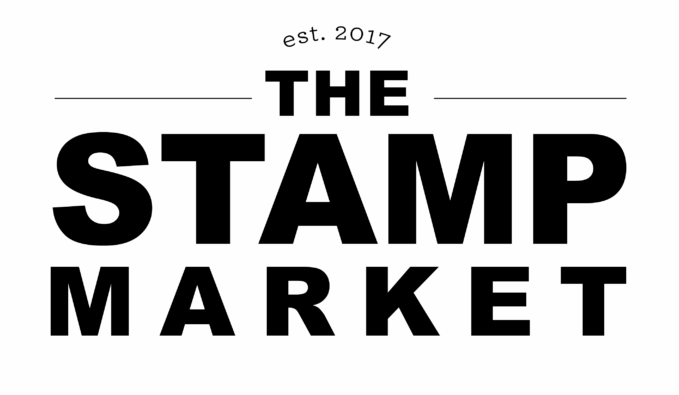 The stamp set is called Sunday Stroll and is a new one in the TAC catalog! 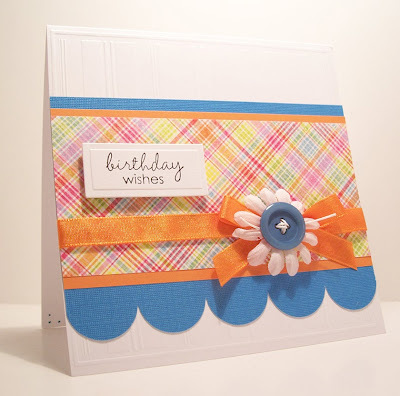 I used Miss Moxie paper for the bright color palette in these first 2 cards! 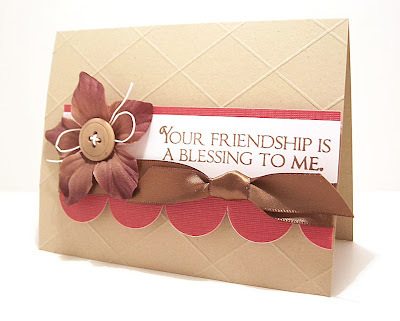 This stamp is from the Friendship Stamps set. I think it made a really fun birthday card! 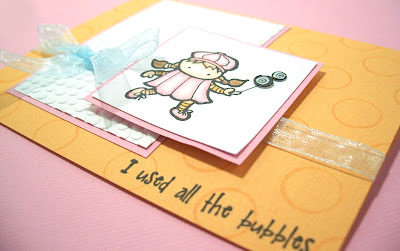 I used Miss Moxie here, too, and added the little ruffle at the bottom for some pop! Thanks for stopping by today! Hope your week is off to a great start! As you may know, our new TAC catalog just came out! Several months back I was contacted by a fantastic gal from TAC, asking if I would be willing to do some design work for the cover of the new catalog! Of course, I was thrilled to be asked! I said yes and soon, a fun little package came in the mail with lots of goodies! I did not make the cover but a couple of my creations are inside! It was such a fun process, I was just honored to be one of the 5 Angels picked for this amazing opportunity! 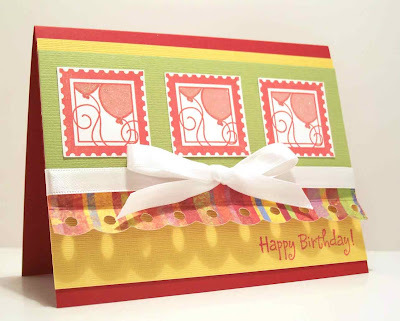 SO, here are just a few of the cards I sent in using the new stamp sets in the catalog! 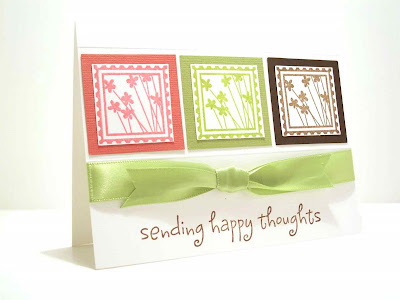 This first card features the stamp set called Flourish Trees of Hope. I just took 2 of the trees, end to end, and made a really fun flourish. The sentiment is from this set as well! 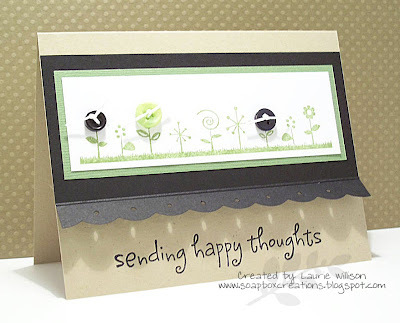 This set is called Friendship Stamps and the sentiment is from Happy Thoughts! 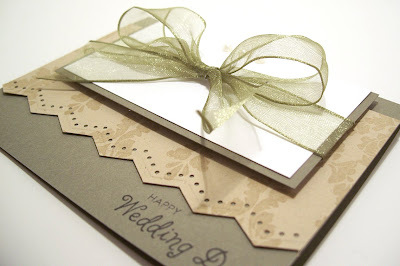 I love this simple and fun card! 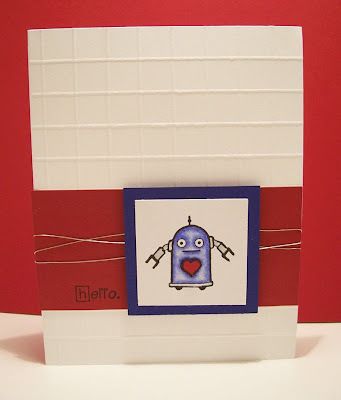 Here is one more card using Friendship Stamps. 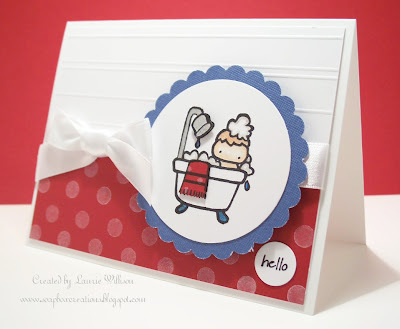 I just love this stamp and it coordinates so well with the Super Jumbo Marvy Square Punch! The sentiment is from Sunday Stroll! Thanks for stopping by today! 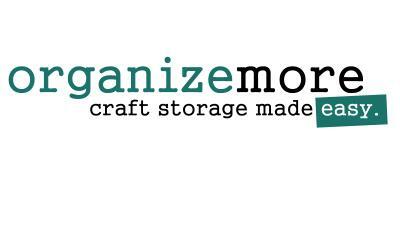 I will have a few more posts soon using the samples I made for the catalog! Have a great Sunday! This little girl is usually holding a leash and a little puppy but I had to add a bubble wand for this one. This is actually an "yo-yo" from the Boys set, but I cut it out, changed it up and stuck it on! This color combo was a challenge in itself. I am not used to working with orange, pink and light blue but I am thinking it looks OK! Now that you have been fully introduced to the "Spunky Sprites" this week and have visited me for day 7 of my 365 challenges, you will have to let me know what ya' think! I am super excited today. For many reasons. I love cake. And this challenge is about cake. My Internet is working. It is stinkin' hot outside but I have AC. I do love my AC. And really, because I have finished day 6 of the 365 challenges! At the beginning of the week, my goal was just to finish 7 days. Tomorrow is the last day! 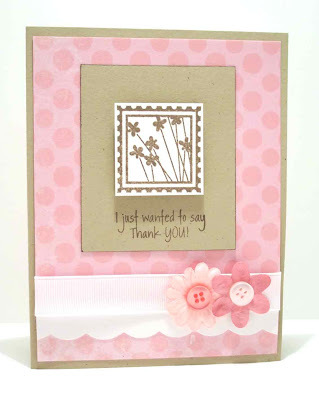 I have been a faithful card maker and blogger! Yeah for me! Ok....sorry....on to the real reason you are here right? I used TAC's Tutti Frutti for this one! These candles are cut from the sample paper in the pack! I thought they made cute little candles! The stars are up on pop dots and then I finished those off with stickles! A card making MUST HAVE. They make everything look great! 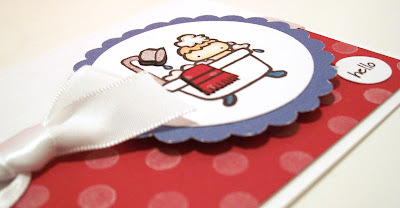 Although the stickles are wet in the picture, the card does just look so much better in real life! The stamp is from a new TAC set called Thinking of You. It is one of the fun new hostess sets! Thanks for coming by today! I have one more day in my week long streak! Can't wait to see the next challenge! If you see anything you like, remember you can always email me to place an Angel Company order or to grab a copy of the FANTASTIC new catalog for $5.00! I know you have already seen this bathtub stamp this week but can you see why I just had to use it? LOL! I also added some Scor-Pal lines in the white. The walls in the picture inspired this! 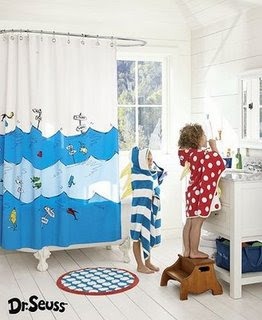 I popped up the towel and the shower head again on pop dots! I love that little touch! And of course I got to use my favorite red! Scarlet cardstock from TAC! Love it! OK you can say that was kinda cheesy(but stiching is today's challenge)....and yes I am double posting again (for you Barb)! 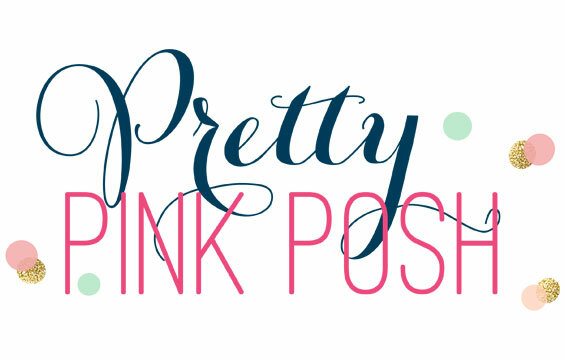 But let me tell you this 365 blog has just got me all sorts of creative this week! LOL! I love it! Today's (or I should say Tuesday's) challenge was to create something with stitching! 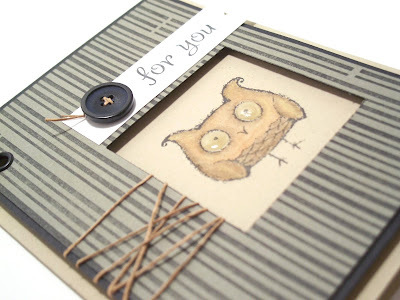 And not just stitching around the card. It had to be an image of some sort. 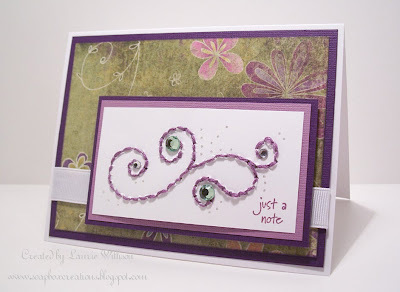 I used TAC's Curls and Swirls, stamped on the back and stitched on the front! I think my "stitching" days might be over now though, because I don't think I did a very good job. I think my sewing machine does a much better job! I also added some bling with some colored gems and a little dot here and there with my Stardust Gelly Roll Pen! I love that thing! 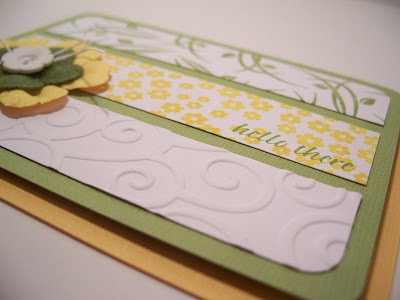 One more note, the background paper is some of my favorite TAC retired paper. I am holding on to it like gold because I just don't want to use it up. (It's like buying a candle and not burning it right?) I love that paper SO much and it isn't available anymore. But I am happy to get it out and use it today! Gonna go play with the kids! Hope you are having a great day! My daughter is stinkin' adorable!! Yes I am saying it! I know all mom's think there kids are the cutest but I am pretty sure mine is! She just turned 5 and she thinks she needs to make cards now. All the time. It is so cute when she pulls up a chair right next to me and says, "Mommy can I make a card?" And then she smiles. And then I melt. My little scrapbooker in the making!! Ok back to the card thing. So I made this card and she said she wanted to make one just like it. She asked if it was ok if she "copied" me!! Again....so cute! This is just another super simple card! I love the Scor-Bug and the texture it adds! There is just so many things you can do with it! 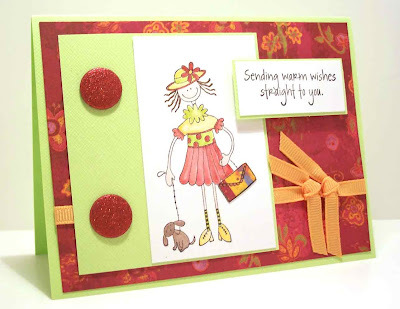 And I had to post a pic of her card too! I cut a base for her and helped her with the Scor-Bug but she inked up and stamped her own images! And then she colored the image with her Barbi makers!! So stinkin' cute! Well, thanks for listening to me ramble on about my DD! She is alot of fun so I just had to share! 365 Challenge and some fun new TAC images! OK, yeah for 365! 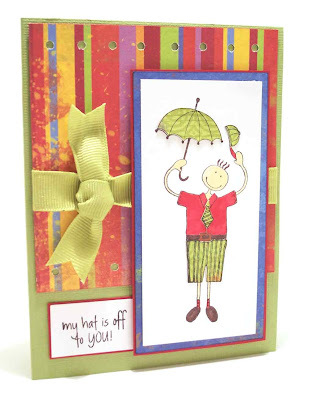 This post originally posedt on Tuesday and then on Wednesday I see the 365 challenge is to make a humerous card! So, I had to come back in here and edit a little to show that this card I just made works for Wednesday's challenge! So here is my "humerous " card and a new TAC stamp set! 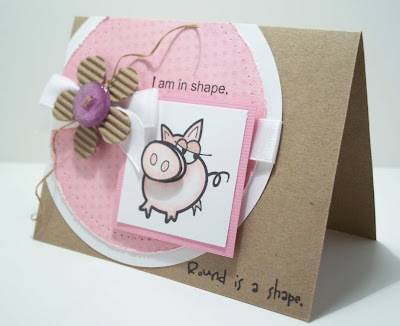 It is from TAC's Funny Farm and Funny Farm Phrases! 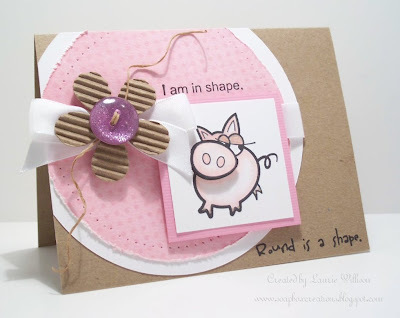 I love the "I am in shape!" So funny! I used a flower punch on a Starbucks coffee sleeve! I thought it made a pretty cute flower! I also cut out her nose and popped it up with pop dots! And she is a "she" if you can tell she has sparkley toenails! hehe! Oh, and sparkley eyelids too! Here is another card using the new owl set, "Be Square"! I had to make a masculine card so I took Heather's idea and made my own background paper with the "Friendship Strips" set. Popped it up on pop dots...yes I have been doing that ALOT lately....and then stamped in the square I cut out with a punch! I added some Crystal Laquer to his eyes and colored him up with colored pencils and OMS, too! So that is it for today! Unless I double post again! LOL! Thanks for looking! OK, so yesterday I got hooked on the whole "challenge" thing! I looked at the 365 blog again today and thought how much fun today's challenge would be so I had to whip one out!! 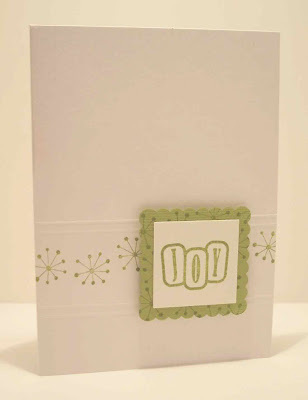 And I needed a baby card, so it was perfect timing! The only thing I added was 2 little pieces of string in the buttons! I couldn't attach the buttons by themselves!! Spunky Sprite Girls and Boys! !